The fifth largest city in France was waiting for its big stadium in recent years. 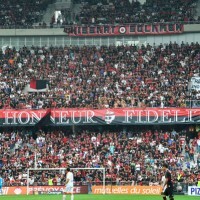 This wish had finally come true for Nice, and on September 22, all roads led to the Allianz Riviera. 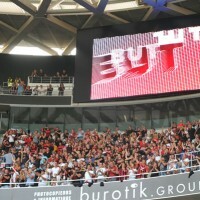 On the occasion of the Ligue 1 match Nice Valenciennes, Allianz Riviera was inaugurated with great fanfare. They came, they were all there, in the arena of the new ultra-modern stadium. 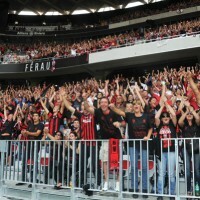 Aficionados have vibrated this afternoon to the sound of Nissa La Bella from the stands. A legend was born. As a molten volcano, it is in an atmosphere of fire that a mass 35,000 people, wearing the colors of the Ray, had made an appointment. While waving flags and banners from the stands, they screamed the names of players on the field, covering the megawatts of the speaker with a “Go Nice”. A calico ” Honor and Loyalty ” was coverig the advertising banner at the south gallery. At the sound of Nirvana, the sound system pushed at its max by the DJ, the atmosphere became downright Rock’nFoot! At 15:00, a short film was screened on the giant screen showcasing the 3,000 workers who participated in the construction of this giant ship. Around 15:30, the stands begin to fill with the arrival of sports stars, our Olympic swimming champion Camille Muffat, the handball player Xavier Barachet, judoka Loic Pietri. At 16h , an eagle flew over the Allianz Riviera. The official opening of this magnificent stadium is underway. 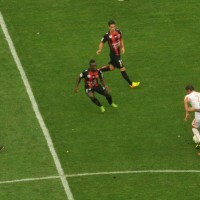 Christian Estrosi, Deputy-mayor of Nice, penetrates the field, holding Matteo’s hand, the child mascot OGC Nice, then it was the turn of Eric Ciotti, of the Prefect of Adolf Colrat followed the President of OGC Nice, Jean -Pierre Rivière. After the Mayor’s rousing speech, a pyrotechnic fog hangs over the Allianz Riviera, a round of explosion springs around the lawn, throwing a shower of confetti to add to the party. 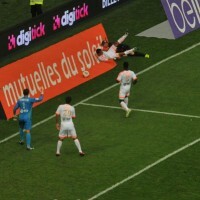 At last, at 17:30 , the time of the confrontation came, to the delight of Nice fans. 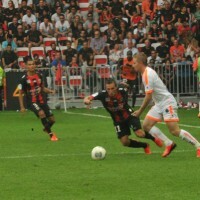 From hot to cold, from enthusiasm to disillusionment, the great popular football game ended with a victory of Nice with 4 goals scored against 0 for Valenciennes. An unforgettable day for OGC Nice, which thus opens a new page of history with this majestic stadium nestled in the Plaine du Var, twice as big as former Stade Du Ray. 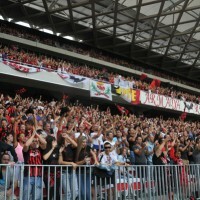 The match was sold out, the 35,000 seats were sold in five days, while the peak attendance for OGC Nice is normally at 15,000 spectators. 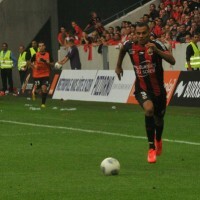 Back in Ligue 1 in 2001, the Nice club came close to qualification in the European Cup in August. The lucky few were able to discover a last generation stadium, reaching level 3 in UEFA’s ranking, designed to maximize their experience… and consumption. Themed restaurants punctuate the wide corridors, designed to be able to watch the game from the bar. 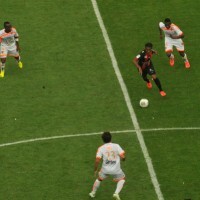 For the fan of technology, whising to Tweet live the course of matches, the arena provides a 4G connection. The Euro, hosted by France in 2016, will find in the Allianz Riviera a high standing field and many great concerts, usually held at neighboring Charles-Ehrmann stadium, will now find a higher level haven. Allianz Riviera, which cost 217 million euros, aims to be the most successful in terms of business model. Vinci funded, built (in 23 months) and now operates this stadium by a partnership agreement. Local governments have paid only a third of the cost. 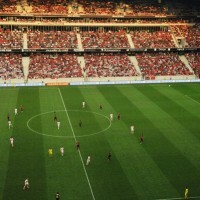 Vinci, through its subsidiary Nice Eco Stadium (NES), will operate and maintain the Allianz Riviera for twenty-seven years, with an annual fee to the city. Thought in every detail to reduce its impact on the environment, Allianz Riviera is a green building model. 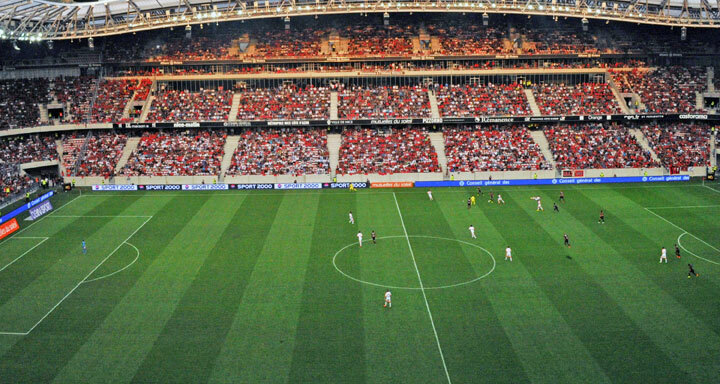 Allianz Riviera will be the first stadium of the UEFA Euro 2016 with positive energy. The framework housing the stands of the stadium consists of glued-laminated wooden beams on the inside. Because of its architecture, its design and its implementation, the outside three-dimensional metal frame is a challenge that carried the carpenter SMB. The metal set of the crown, forming a slight curve rising to 30 meters high above the stadium consists of 3,300 tons of steel, more than 115,000 parts and 100,000 bolts. Recalling the natural movement of a wave, the architecture of the stadium fits into the landscape of the hills of Nice. 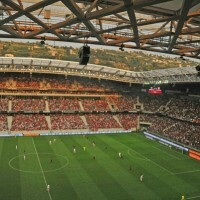 Allianz Riviera was entirely designed using up natural and renewable resources. This project relied on the massive use of structural wood (3 100 m3), geothermal heat to produce fresh, natural ventilation, recovery of water for watering the lawn and the sanitation and the implementation of a PV system consisting of more than 4,000 solar panels (about 7000 sqm) of European manufacturing. The covering membrane is a mixture of ethylene tetrafluoroethylene, it covers the entire facade and interior spoilers. With this solution, the architects have chosen the transparency to reduce the boundary at the maximum between inside and outside and to showcase the stadium at night. This shell allows the diffusion of a not dazzling natural light, and at night to diffuse the stadium lights. 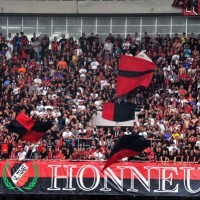 With this inaugural match Nice Valenciennes played sold out, the attendance record of the club established in 1952 was broken, but it was a different time then. 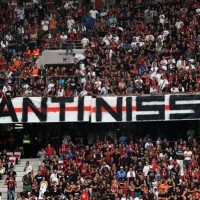 Long life to multi-purpose Allianz Riviera! Click on pictures to activate the galery.